For many of us, breakfast is the most important meal of the day and now students at Safety Bay Primary School (SBPS) can also enjoy a healthy kick-start to their day thanks to a grant from Kleenheat. 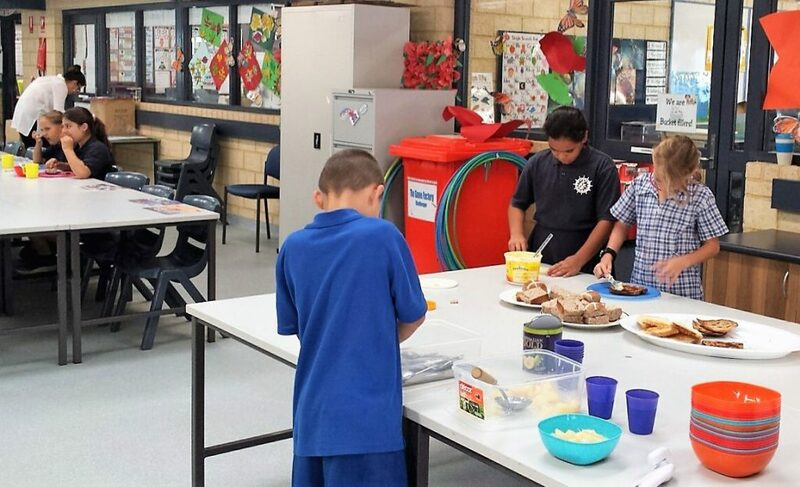 As part of the Community Grants Program, Kleenheat has provided funding to the SBPS Breakfast Club initiative which offers breakfast to students who would otherwise not have the opportunity to have a meal before school. Along with food items, funding from Kleenheat has enabled the school to purchase a chest freezer to store bread, which is regularly donated by Foodbank. Safety Bay Primary School students at the Breakfast Club initiative. Special Needs Assistant Katrina Muirhead said providing a healthy breakfast has allowed the students to start the day on a positive note which supports their learning and has many other benefits. “The students are also learning life skills by preparing their meals and washing and drying dishes,” she said. Safety Bay Primary School has a student population of around 750, with between 40 to 50 students attending the Breakfast Club sessions. The Community Grants Program allows Kleenheat to provide funding to not-for-profit organisations running programs, activities and events benefiting the communities closets to our operations in Kwinana and Rockingham.